Add all the ingredients into a large mixing and mix until well combined. On a medium heat, heat a large, non stick, oven proof frying pan with 1 Tbsp oil. Pour in enough mixture to cover the base of the frying pan, about 1cm thick. Leave to cook for 4-5 minutes. Transfer the pan to the oven and grill until firm on top (4-5 mins). Use a flat spatula to loosen the base then slide out of the pan onto a plate. Either use a cookie cutter to cut out round latkes or leave it whole for a giant latke! Delicious topped with anything from tomato and grated cheese to smoked salmon and avocado! 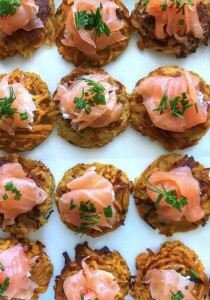 Follow Jenny on Instagram @saladforsupper or go to www.saladforsupper.com for quick, easy, simple recipes! Jenny is passionate about creating healthy food that is delicious, innovative and inspiring, and can be realistically recreated at home!